... according to a USA TODAY/Gallup Poll over the weekend when "Mission: Impossible III" opened to $47.7 million, about $12 million less than expected, the public has lost its loving feeling for Tom Cruise. Still, as much as Cruise's career may be down around his ankles, I was confident the May 5th opening wouldn't be "Waterworld" redux. It would follow the summer pattern: the earlier a film is released in May, the better the box office. But, in the final analysis, "MI3"'s first weekend was near disastrous. And then there was this, from that awful E! gossip Ted Casablanca (of "The Awful Truth"), who had the temerity to suggest that Cruise's relationship with the mother of his child, Katie Holmes, was nothing but a (disastrous) public relations sham -- like Michael Jackson and Lisa Marie Presley, or something! According to a source who plans everything from Mr. C.'s vitamin schedule to his glad-handing duties (gosh, which one's more exhaustive, the former or the latter? ), Katie Holmes and Tom C. are working out, as we cyber-gossip, a respectable amount of time to remain together after [baby] Suri's arrival, until they will call it quits. "They are not getting married," insists this Cruise insider. "Won't happen." 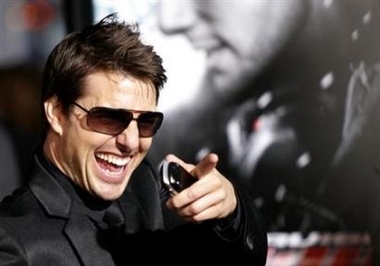 How much fun is the Tom Cruise meltdown? Here's my favorite thing about it... He's so crazy the gays don't want him anymore. They don't want him. They don't care... I love how the gay guys only want hot guys to be gay, right? They want Gyllenhaal, they want Ledger, they want Colin Farrell. Here's what you'll never hear from one of the gays: "Oh, girl. Don't be naive. Don't tell me you don't know about Miss Gene Hackman." In a rare public show of support for a beleaguered star, some of Hollywood's top executives rallied to Tom Cruise's side on Wednesday as a new poll suggested his odd behavior in recent months may have cost him millions of dollars at the box office. Among the movie industry heavyweights offering personal testimonials to his talent and bankability were Universal Studios President Ron Meyer, veteran producer Jerry Bruckheimer and Paramount Pictures Chairman Brad Grey, whose company released Cruise's latest film, "Mission: Impossible III." "Tom Cruise is one of the most important stars ever in the motion picture business," Ron Meyer, a close friend and former agent, told Reuters. "I don't know anybody who has had the consistent success rate that Tom has. And nobody should be counting him out." Added Grey: "He is clearly, on a profit basis as well as a creative basis, one of the biggest stars in the world."